In 2012 I had the privilege of teaching at a middle school and working with a very kind and smart student who loves music, and enjoys composing. He is now a sophomore in high school and taking composition classes. This year he composed a piece that was selected to be performed at the All-County Orchestra and Chorus concert, and he also received a scholarship for it! So proud to have been involved in his musical development. Listen to some of his compositions here. In the program were some interesting facts about music and how it effects the brain and development of children. This is the “Did You Know?” page. 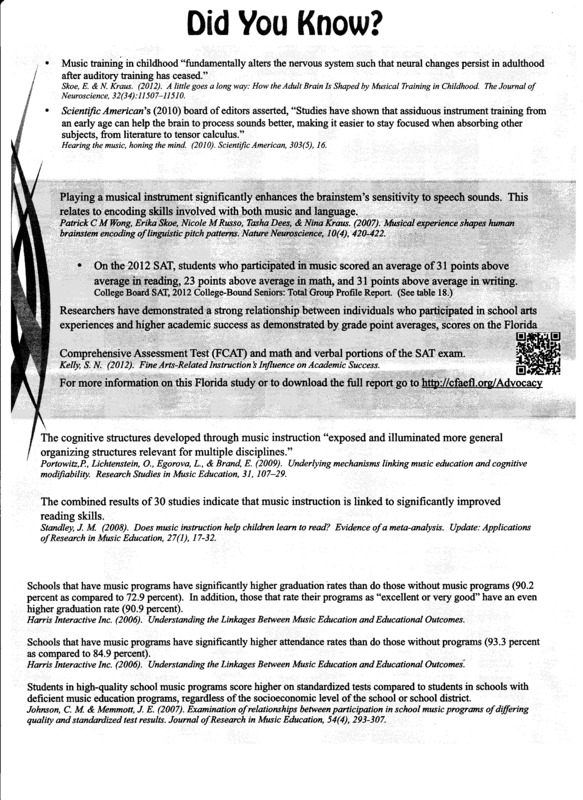 This entry was posted in Informational, Inspirational and tagged all-county, attendance, band, brain, chorus, compose, composer, composition, did you know, ensemble, FCAT, graduation, music, nervous, orchestra, perform, play, reading, rehearse, research, SAT, science, scientific, score, skill, speech, studies, study, system, test, violin. Bookmark the permalink.